• Divisions between teachers and the public are wider and deeper than differences between other groups often thought to contest school policy, such as Republicans and Democrats, the young and the old, the rich and the poor, or African Americans and whites. 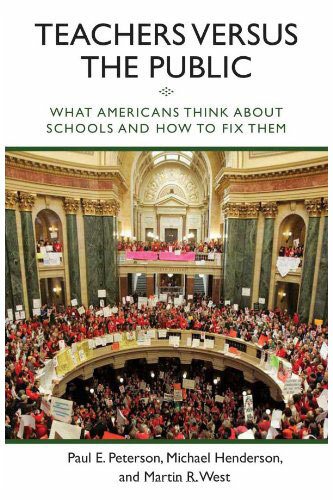 • The teacher-public gap is widest on such issues as merit pay, teacher tenure reform, impact of teacher unions, school vouchers, charter schools, and requirements to test students annually. • Public support for school vouchers for all students, charter schools, and parent trigger laws increases sharply when people are informed of the national ranking of student performance in their local school district. • Public willingness to give local schools high marks, its readiness to support higher spending levels, and its support for teacher unions all decline when the public learns the national ranking of their local schools. • On most issues, teacher opinion does not change in response to new information nearly as much as it does for the public as a whole. In fact, the gap between what teachers and the public think about school reform grows even wider when both teachers and the public are given more information about current school performance, current expenditure levels, and current teacher pay. The book provides the first experimental study of public and teacher opinion. Using a recently developed research strategy, the authors ask differently worded questions about the same topic to randomly chosen segments of representative groups of citizens. This approach allows them to identify the impact on public opinion of new information on issues such as student performance and school expenditures in each respondent's community. The changes in public opinion when citizens receive information about school performance are largest in districts that perform below the national average. Altogether, the results indicate that support for many school reforms would increase if common core state standards were established and implemented in such a way as to inform the public about the quality of their local schools. These and many other findings illuminate the distance between teacher opinions and those of the public at large. About the Research: In partnership with the Harvard Program on Education Policy and Governance and the journal, Education Next, authors Paul E. Peterson, Martin West and Michael Henderson surveyed nationally representative samples of teachers and the public as a whole annually between 2007 and 2013. "An eye-opening book about the current state of education reform. While teachers tend to support the status quo, the public—especially as it becomes more informed about school performance—is increasingly looking for major changes. And major changes are what our schools will need if they are to succeed at effectively educating our children for the modern world." "This in-depth report explores the minds of American teachers, their focus on educating students, and the minds of the general public, identifying the opportunities—and the challenges—for all those who seek to improve the education of the next generation." "The immense value of Peterson, Henderson, and West's well-researched overview of our nation's attitude toward education issues is that it highlights the divide between the educators who teach in our American public schools and the general public who have a huge stake in how those schools teach our kids. Their findings underscore an urgent need for supporters of education reform to engage with teachers and work collaboratively toward our shared goal of a world-class public education system." "This scholarly book corrects and changes the political debate. The authors reveal that it is teachers themselves—not just their union representatives—who stand opposed to school reforms a majority of the public favors. In many ways this points to a much larger problem with improving our schools."